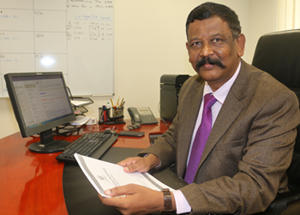 The top tier consists of the DQA headed by Dr. Sanjay Ramteke, Director of Quality Assurance and supported by Ms. Amina Al Mashikhi, QA Coordinator. 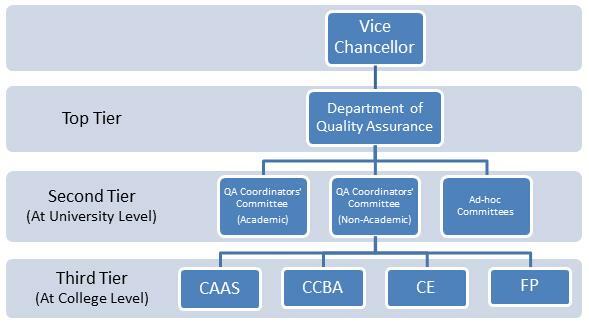 The second tier is at University level, which consists of two standing committees, namely QA Coordinators’ Committee (Academic), having representatives from all three colleges and the Foundation Program (FP) and QA Coordinators’ Committee (Non-Academic), having representatives from all non-academic departments. In addition, a number of ad-hoc committees are constituted from time to time to support the DQA in its work. The third tier is at the College and FP level in the form of a College (FP) QA committee. The College QA Committee is chaired by the College Dean and the members are the QA coordinator and Department Chairs in the College. Likewise, the FP QA committee is chaired by the FP Director and the members are the QA coordinator and the program/level coordinators in FP. The DQA is responsible for maintaining a high level of quality in teaching, learning and research, as well as various other services provided for the students, staff and DU community. It does so by suggesting new policies and reviewing the existing policies related to academic matters, academic support and non-academic services. It consults stake-holders concerned before making any suggestions/recommendations. The DQA also develops appropriate qualitative and quantitative standards for teaching and service-related performance, taking into account local, regional and international recommended practices, including standards set by MOHE, OAAA and other international accreditation authorities. The DQA is also responsible for meeting the requirements of MOHE in regard to quality assurance and providing them with the required data. The department also carries out all work related to institutional accreditation by OAAA. These committees serve as a link between the DQA and various Colleges/Departments. The main role of these committees is to assist the DQA in its policy formulation work and implement these policies in their respective College/Department with the help of College level QA committees. These committees are responsible for actual implementation of QA work in their respective colleges (FP). For non-academic departments, QA work is implemented through the respective Directors. These committees are constituted from time to time by the DQA for carrying out a specific task. Once the task is accomplished, the committee is automatically dissolved.